Roth 401(k) plans are great. If your employer offers one, look into using it. Why Should I Be Interested in a Roth 401(k)? While you might think Roth contributions are only for the young, the truth is many people age 55 and older can still benefit from the tax-free growth and tax-free future withdrawals that a Roth account provides. Roth accounts provide an income source in retirement that is free from taxes. You can use this account as a lever for minimizing tax payments during your critical retirement years when you need money for life’s adventures. When saving for retirement you want to defer taxation on dividends, interest income, and capital gains when practical. With a Roth, you can entirely avoid paying taxes on these sources of investment income, in which case the deferral strategy has paid off to the maximum. There are several differences between a Roth 401(k) and a Roth IRA. 1. Income limitations: If you make too much money, you are not eligible to contribute to a Roth IRA. There is no such income limitation for Roth 401(k) contributions. 2. Contribution limits​​: The maximum contribution amount to a Roth 401(k) is much higher than for a Roth IRA, so you can save more, and investment growth and distributions will be tax-free in your retirement years. 3. Distribution rules: With a Roth IRA, you can withdraw your original contributions at any time. With a Roth 401(k), that is not so. Your plan may allow you to borrow against your 401(k), or take a hardship withdrawal, but for the most part, your distribution options are limited while you are still employed by the company offering the plan, or until the later of you reaching age 59 1/2 or having the Designated Roth account for at least five years. All 401(k) qualified retirement plans allow you to defer a portion of your salary. Regular 401(k) plan contributions are contributed to the plan on a pre-tax basis. That means you pay income taxes later when you take the money out instead of now. Roth 401(k) plan contributions are contributed on an after-tax basis. That means you pay income taxes now on the amount contributed to the plan, but once it is in there, it can grow tax-free and be withdrawn tax-free in retirement. These tax-free withdrawals can be quite beneficial to you once you are in your 60s and 70s and also collecting Social Security. Roth accounts offer one of the few ways to truly grow money tax-free. As long as you follow the rules, all the interest, dividends, and capital gains inside your Roth will never be taxed again. Roth distributions do not count in the formula that determines how much of your Social Security benefits are taxable. Roth distributions do not count in the formula that determines the amount of Medicare Part B premiums you pay. 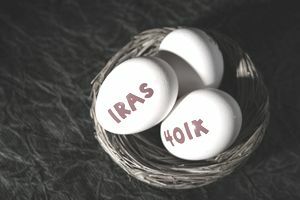 With a Roth IRA, unlike with a regular IRA or regular 401(k), you are not required to start distributions at age 70 1/2; however, Designated Roth accounts in a 401(k) plan are subject to the required minimum distribution rules. You can avoid these required distributions by rolling your Designated Roth account to a Roth IRA upon retirement. Remember, while you remain employed, you cannot do a rollover. Roth accounts pass tax-free to your beneficiaries. With a 401(k) plan as early as 55 you can take penalty-free distributions, as long as you retired from the company at 55 or later. If you retire prior to age 55 or have an old 401(k) plan you will have to wait until age 59 1/2 to take penalty-free distributions. This ability to take penalty-free withdrawals at 55 or 59 1/2 may not always apply to the Roth 401(k) accounts. With a Roth 401(k) distribution, a special five-year rule applies. Before you can avoid tax on distributions, your Roth 401(k) contributions must be held for a minimum of five years, even if you are over age 55 or over age 59 1/2. Example: If you started making Roth 401(k) contributions for the first time in the calendar year that you turned age 57, the first time you would be eligible for tax-free distributions would be in the calendar year you turned 62. Note: Unlike Roth IRAs, Roth 401(k) accounts do not allow for penalty-free early withdrawals for first-time homebuyer expenses. What About the Employer Match? If you select the Roth 401(k) option and your company provides a matching contribution benefit, the match will go into a regular pre-tax 401(k) account and will be subject to required minimum distributions and normal taxation upon withdrawal. When you separate from your company you could later roll those contributions into your Roth IRA and pay the taxes. Don't do this until first talking to a financial planner to see if it's the best move for your retirement plan. How Do You Get a Roth 401(k)? If you are an employee, ask your employer if they allow Roth 401(k) contributions, and if they don’t and you would like to have this option, then express your preference to human resources or to the business owner. Not all employer plans offer this option but as more people have learned and requested a Roth option, employers are responding and more plans now offer it. If you are a business owner with employees, you can look into setting up a 401(k) plan for your business that allows Roth contributions. The administration costs may vary from provider to provider, so shop around. If you are self-employed with no employees other than your spouse, you may set up what is sometimes referred to as an Individual(k) or Solo(k) plan that allows you to make Roth 401(k) contributions. Note: There may be a case to have both types of 401(k) contributions; Roth and pre-tax. Consult a financial planning or tax professional to review your unique circumstances to see if this is appropriate. The multi-thousand dollar question is, does it makes sense to pay tax now or later? The answer depends on your tax rate now, and your projected tax rate in retirement. For most folks, it makes sense to reach retirement with a balance of both pre-tax and tax-free accounts to draw from. That means you would want to contribute to both account types along the way. In general, pre-tax contributions make the most sense when your tax rate is 28% or higher. Roth contributions make more sense when your tax rate is 25% or lower. For detailed regulations on Roth 401(k) plans visit the IRS Website, Retirement plan FAQs on Designated Roth accounts.